Not sure what mail class to use? Stamps.com makes it easy to choose. 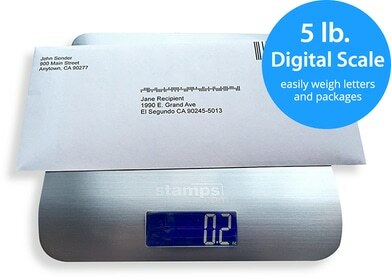 Based on package size, weight and delivery address. Stamps.com will show you all the Mail Classes available along with the price and estimated time of arrival for each. If you’re using FedEx or UPS for your shipping, you may be leaving a lot of money on the table by not using the U.S. Postal Service. Stamps.com shows you when using the USPS is the smarter, more cost-efficient way to ship your packages. Learn more about why you should choose USPS over UPS and FedEx. With Stamps.com, International shipping is a breeze. No need to go to the Post Office. All necessary forms are built right into the software! Just input your information and Stamps.com automatically chooses the correct form for you. That means you’ll never have to handwrite another customs form. Sending letters or packages internationally can be very expensive. With Stamps.com, you have the option to save money and send them First Class Package International Service. For example, if you had a 1 lb. package going from Los Angeles to Paris, France, you would save $21.80 (48% discount) per parcel by using First Class Package International Service instead of using Priority Mail International. With a single click, you can add Package Insurance (up to $10,000) plus a variety of USPS special services including Free USPS Tracking with Priority Mail Express, Priority Mail, First Class Package Service, Media Mail and Parcel Select Ground, Certified Mail, Return Receipt, Registered Mail and more.